What comes to mind when you think of the desert? Perhaps a scene from Lawrence of Arabia or The Ten Commandments with a solitary person in a white robe and sandals struggling through endless sand and large dunes whipped up by brutal winds under a scorching sun. The Negev in southern Israel can be oppressively hot, but you won't see the type of sand dunes associated with the Sahara or other deserts. Actually, the Negev is filled more with dirt, rocks and canyons, which are no less forbidding. The Negev is also beautiful, highlighted by remarkable landscapes, waterfalls, caves, archeological sites, cities, craters and a rich history. In 1947 and 1948, when the boundaries of the Jewish and Arab states were being debated by diplomats, David Ben-Gurion insisted the Negev be part of the Jewish state. Though it was virtually uninhabited and thought by many to be uncultivable, Ben-Gurion knew this region was needed if the state was to grow. He also had faith the desert could be tamed and turned into a place where Jews could settle and prosper. More than 50 years later, his vision has been realized. settled in permanent homes. 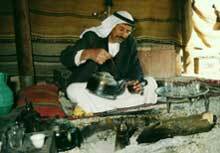 It is often possible to visit the permanent and semi-permanent tents of these hospitable people and enjoy sweet tea and the best pita you'll ever taste filled with goat cheese and a delicious spice called zater. Some of the encampments are regular stops for tourists, but others are more authentic villages where sheep and goats are tended, and the ways of old still are observed by young and old alike. The gateway to the Negev is a place that once was little more than a watering hole for Abraham's sheep. Today, Beersheba is a modern city of 130,000. Further south is Kibbutz Sde Boker, where Ben-Gurion made his home. Today, the hut where he lived is a museum devoted to his legacy. The Central Negev is marked by Makhtesh Ramon, which is usually referred to as a crater, but is actually a valley surrounded by steep walls. Rappeling off the edge of the crater is popular, but not recommended for beginners. For those who don't mind a less direct route, there are trails for hikers into the crater. Between Beersheba and Makhtesh Ramon is a whole lot of nothing, except beautiful and sometimes forbidding landscapes. Seemingly in the middle of nowhere are the remains of ancient Nabatean Cities. The Eastern Negev has two of the area's larger towns. The first is Arad, a development town that serves as a convenient stopover for visitors to the Dead Sea and Masada. The town is also popular because of its clean, dry air, which makes it a haven for people suffering from asthma and allergies. Nearby is Tel Arad, site of a biblical town that is one of the earliest known urban settlements. Further south, on the way to Eilat is Dimona, a town established in the 1950s to help absorb Jewish inmigrants. Originally considered too remote and its climate too unpleasant for large-scale settlement, the town has grown to be a thriving community of more than 20,000. It is best known, perhaps, as the site of Israel's nuclear research program and is believed to be the site where nuclear weapons have been developed. It is also known as the home of the Black Hebrews, a sect that originally came from Chicago and settled in Dimona. Just beyond Dimona is Mamshit, one of the best preserved of the Nabatean towns. It was built in the first century, probably the last of the five cities the Nabateans built along the roads from their capital in Petra to the coast. Over the course of several centuries, the Nabateans abandoned their nomadic way of life and became permanent settlers who focused on agriculture. Given the harsh climate, this was a strange choice, but the Nabateans proved to be remarkable engineers and developed sophisticated systems for controlling the scant water resources. Mamshit was annexed by the Romans in 106 C.E. and the town was renamed it Memphis. The town grew for several centuries until being abandoned after the Muslim conquest in 636. During the Byzantine era, three churches were constructed and the remains of some of the mosaics are still visible as are parts of the Roman city walls. In one room archaeologists found a bronze jar filled with 10,000 silver coins dating from the first and second centuries. The southern route to Eilat, a long and mostly boring stretch of more than 100 miles, is dotted with small agricultural settlements, including two kibbutzim affiliated with Reform Judaism. The Yotvata kibbutz, just north of Eilat, is one of the major dairies in Israel, which is open to visitors.